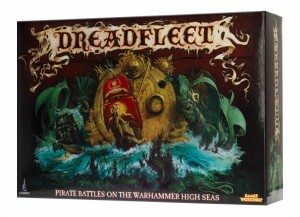 Play Unplugged has reviewed Games Workshop's Dreadfleet. Dreadfleet offers fantasy naval excitement for the miniature table-top. The latest offering from Games Workshop’s irregular series of limited edition games, the Dreadfleet boxed set comes packed with ten plastic ships, plastic island terrain, dice, counters, rules, cards, and a gorgeous cloth play-mat that represents a high-seas environment. A subsequent review will focus more on the storyline and rules of the game, while this one will cover the models and terrain that come in the boxed set.